This Concept Brief is part of a series on financial intermediation in small-scale, pro-poor investment deals in developing countries. This series highlights approaches that mobilize private capital from banks and other financing institutions to support micro, small, and medium enterprises (MSMEs) through leveraging resources, integrating incentives, and mitigating risk in deal and investment structures. Micro, small, and medium enterprises (MSMEs) in developing countries have tremendous potential to increase economic growth and to support a broad array of development objectives. However, MSME entrepreneurs often face barriers to accessing the financing they need to start or expand their enterprises. 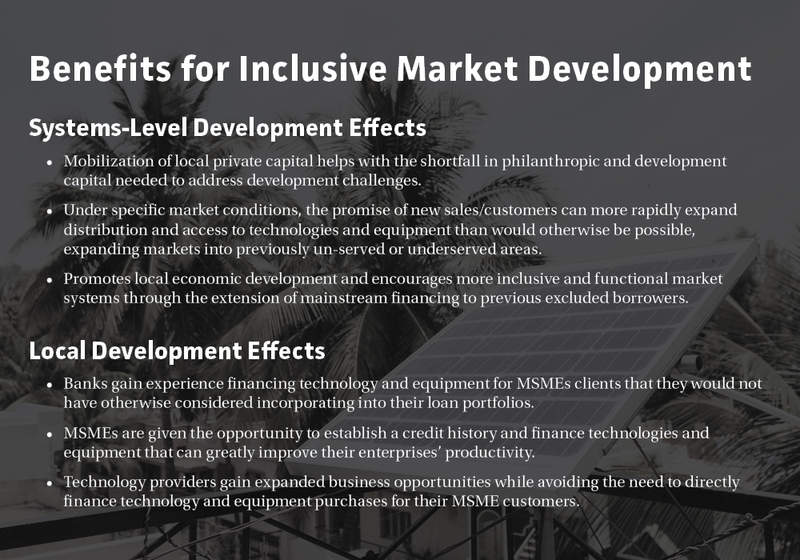 Many MSME entrepreneurs have capital requirements that exceed microfinance ceilings but they often cannot access bank or similar financing without established credit histories, documented business track records, and/ or collateral (often required in the form of savings or immovable assets). The challenges of meeting bank and other financial institution lending requirements are often further compounded by these institutions’ lack of familiarity with pro-poor business models and the technologies involved. Furthermore, banks and other financial institutions often do not want to get involved in secondary markets for used technologies in the event of loan defaults. As a result, banks and other financial institutions tend to bypass the MSME market due to the actual or perceived risks and the anticipated transaction costs. This situation effectively excludes MSME entrepreneurs from accessing mainstream financing, leaving few if any alternatives beyond “friends and family” sources since informal financing from moneylenders or similar sources is typically offered at significantly higher interest rates. While certain durable and high-demand technologies and equipment maintain their value even after several years of use, many banks and financial institutions in developing countries will often not accept moveable technology or equipment as collateral when structuring loans since they do not want the responsibility of selling used technologies and equipment directly or through brokers on the secondary market in the event that clients default on their loans. Buy-back agreements for movable technology and equipment can help to overcome banks’ and other financial institutions’ reservations about lending to entrepreneurs for technology and equipment purchases by shifting the responsibility for repossessing and then selling the used technology or equipment in cases where loans cannot be renegotiated. In buy-back agreements, technology providers formally agree to purchase and physically remove technologies or equipment sold to MSMEs in the event that the MSMEs cannot or refuse to repay their loans for these items. Buy-back agreements are arranged in advance of the initial sales of technologies or equipment and state the terms and conditions under which any buy-backs would occur. These agreements will, at a minimum, specify the amount that the technology provider will pay for the used technologies or equipment, often based on the conditions on as well as a set depreciation on schedule. 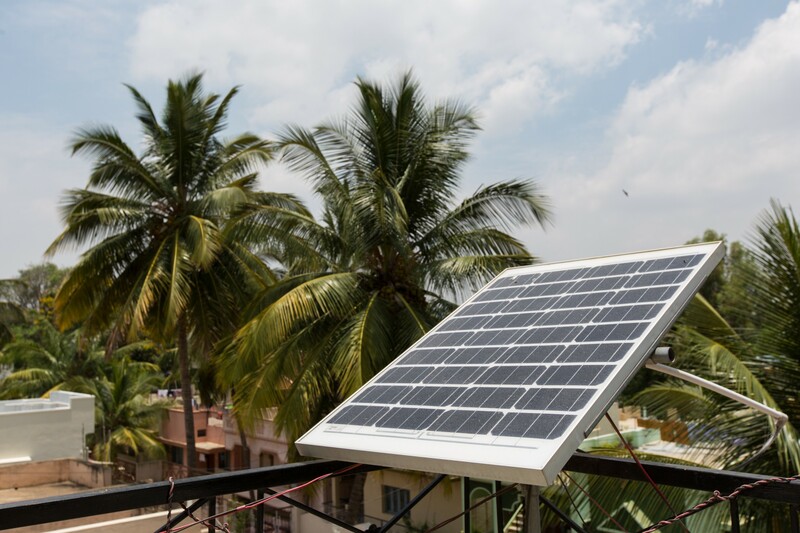 Examples of technologies or equipment that are best suited for buy-back agreements are photovoltaic panels and certain types of farm machinery that are durable, reliable, and are highly sought-after in the marketplace. It is important to note that while buy-back agreements can increase the likelihood that banks and other financial institutions lend to MSMEs for technology and equipment investments, these agreements alone often need to be offered alongside other mechanisms, such as loan guarantees, in order for lending to occur. The promise of new sales/customers and the resulting profit potential more than offsets transaction costs associated with the re-sale of used technology and equipment (transport, refurbishment, etc.). The last factor can be especially important when it would otherwise be difficult for the technology provider to sell its equipment to certain markets or clients due to high transaction on costs of developing a marketing campaign or distribution on network. By leveraging the on-the-ground work of practitioners and other deal facilitators, technology providers benefit from facilitated deal arrangements with new vetted and supported clients.